From the back cover: Jimmy Dorsey has had only twelve birthdays! For Jimmy was born on the 29th of February in the leap year of 1904. The event took place in Shenadoah, Pennsylvania, and it was there that he grew up, learning to play the cornet and later the saxophone and clarinet while going to school. He also added to the family income by working as a driller's helper in the nearby collieries. At seventeen he was a bandleader. At eighteen he was offered a job as a saxophonist and clarinetist with the Scranton Sirens, one of the forerunners of the so-called "hot" bands. That interrupted his career as an orchestra leader for a long time, from 1922 to 1934, but during those years as an instrumentalist he came to be identified with practically every famous dance band in the country. From 1932 to 1935, Jimmy and his trombone-playing brother, Tommy, enjoyed spectacular acclaim with their Dorsey Brothers Orchestra. In 1935 the two brothers went their separate ways, both as leaders, and, remarkably enough, each to greater heights in the dance band field that they had attained together. 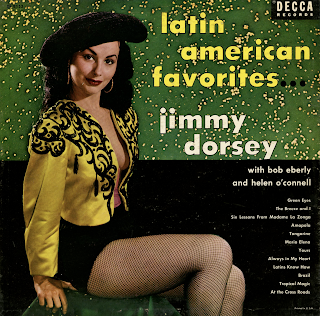 Jimmy Dorsey's was one of the most rapid rise in the history of dance bands. His orchestra played its first engagement at the swank Sands Point Club on Long Island, where NBC gave them the first wire out of the spot. Then followed bookings at Ben Marden's Riviera on the Jersey Palisades, the Palais Royale on Broadway, and the Glen Island Casion. The band went on a westward trek of theatre and one-night stands, eventually reaching the coast and opening with Bing Crosby on the Kraft Music Hall air show from Hollywood. In 1939 the band made its first appearance on the stage of the Strand Theatre, New York, a showplace where it holds the all-time house records. 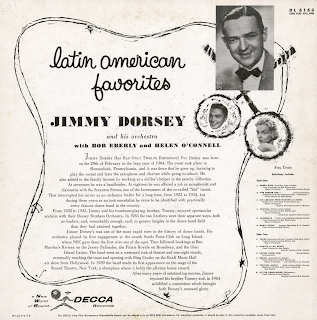 After many years of outstanding success, Jimmy rejoined his brother Tommy and, in 1954 solidified a connection which brought both Dorsey's renewed glory. 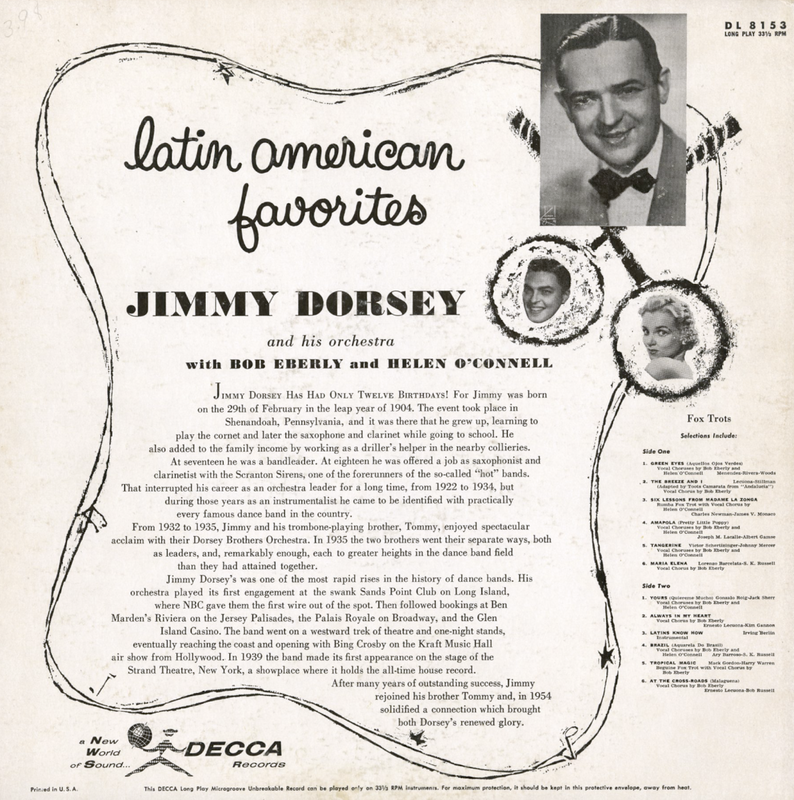 From Billboard - November 12, 1955: Decca has packaged 12 of Jimmy Dorsey's most famous old sides from the early '40s, including such all-time clicks as "Amapola," "Tangerine," "Maria Elena," "Yours" and nostalgic appeal and should fare well sales-wise. A big extra sales plus is the cover – a striking color photo of an Ava Gardner-type brunette in a peek-a-boo toreador jacket.